Jeovany Jimenez Vega, 26 October 2015 — Without a doubt the most complex challenge Raúl Castro’s regime has in the short-term is monetary unification. The use in the country of two national currencies for the last two and a half decades has ended up generating an inestimable distortion in the internal finance system, which by itself would be enough to illustrate the chaos reigning in the economy, of which this is a sharp reflection. The recent declaration of U.S. Senator Rodney Davis on the imminence of change awakened expectations on the subject, which has been strikingly absent in the speeches of the General/President and in the official Cuban press, in spite of the fact that its persistence converted it some time ago into something unique. 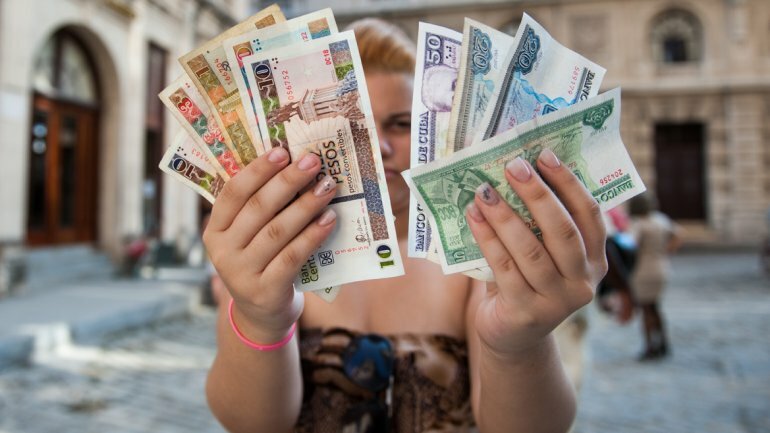 If several contemporaneous countries once permitted the indistinct circulation of a foreign currency together with their own, I don’t remember one that used two national currencies together, like Cuba has done since the ’90s: to wit, the Cuban peso, the CUP — so withered, humble, poor — and the CUC, the all-powerful Cuban “convertible” peso. For more than two decades, 90 percent of Cubans have received their monthly “salary” in CUP, and when they shop in the “dollar” stores, they have to pay in CUC, at a rate of 25CUP/1CUC. This is the biggest scam suffered by our people since the arrival of Columbus. In the previous period, before the arrival of the CUC at the beginning of the ’90s, there had already been quaint situations, since during the better part of that phase Fidel Castro made the simple holding of foreign currency – above all the American dollar — into an authentic body of crimes reflected by all the letters in the penal code, and hundreds of Cubans suffered in prison. But it’s worth little to dig up the past; today we need to turn over a new leaf and write a new chapter. Like neophytes, we don’t really hear the intimate ins and outs of the economy, habitually plagued by obscure nuances that we can’t guess. But it’s worth it anyway to ask concrete questions about the unification of Cuban currencies. One indispensable step would be to demand, starting now, every opportunity sighted on our horizon. Today every proposal stipulates, as a prior condition, the coherence of its financial system, since nothing else would earn the essential credibility that international organizations and investors need. So, since everyone is aware of this, why delay one more day with the inevitable change? But this is where you would have to stop to avoid this necessary step from ending badly and generating disastrous social consequences in the short-term. But all this supposes that the Cuban Government — the one definitively responsible for having generated and maintained such an unusual policy — assumes responsibility for the complete process in a way that mitigates potential harm; and that it will happen in the least abrupt way possible, without generating or minimizing possibly traumatic consequences for the already-poor Cuban people. I’m speaking concretely. I wonder if, instead of having an abrupt change of currency right now, it wouldn’t perhaps be possible to gradually reevaluate the weaker money, through a programmed process and with public knowledge — let’s say lowering the exchange rate of the CUC in the CADECA (the official exchange bureau) at a rhythm of 1 to 2 CUP monthly — so that at the moment of exchange the rate would be less pronounced than now, let’s say 10 to 1, for example. Another element to take into account is the time it would take for the population to complete the change, meanwhile guaranteeing the possibility of exchanging all the cash circulating without the Government interposing senseless obstacles. Those in the old guard remember the untimely way in which this process was carried out at the beginning of the ’60s, and all the absurd limitations imposed at that time, which caused a considerable part of the money in circulation to simply became void. Right now there can’t be any justification for the Cuban Government to appear arbitrary. In its place, a period of some months should be available to complete the change, during which both currencies would continue to circulate at the fixed rate until the one destined to disappear remains only a numismatic memory. After all, as any grandfather will tell you, he who hopes for much can wait a little, and something that has harmed us for so many years can’t be reversed in a few days. On this point I’m beginning from the supposition that the currency that will disappear will be the CUC. The untimely presence of this spawn, “convertible,” paradoxically, only inside Cuba, together with the Cuban peso, would be something senseless and counter-productive in a Cuba that is open to the world. No sane person would consider retiring the CUP from circulation in place of the CUC. To do this suddenly, after fomenting rumors during the last two years about the presumed permanence of the CUP, which is still being exchanged for CUC in the street, would be a miserably low blow. Of course, for everything to succeed, or to put it another way, to be something that doesn’t imply huge domestic trauma, the political goodwill of the elite Cuban Government would be necessary: something that up to now hasn’t exactly been celebrated. If it is economically coherent, it should free up productive and commercial openings, which would foster an immediate circulation of goods and services generated by wealth, all of which would be possible in the short-term — an effort which, although at the beginning wouldn’t be achieved on a large-scale or with all the urgency that circumstances demand, would be oriented, without doubt, in the right direction, and would then be a comforting first step in support of the stability of a future single currency. Then in the short and mid-term, the positive result could be felt, but only if the Government accedes to immediately freeing up the management of the private sector of society and stops putting unreasonable obstacles in the way of every private initiative. This would be, in my humble and novice opinion, a variant to take into account. Studying to see if this would be something practical and attainable now is a job for the experts; it is only one more proposition.